Cozy Chicks: Whatever happened to homemade? Earlier this week, Mr. L and I decided we'd like to have hamburgers. We went to the store and they had NO premade hamburger patties. So we settled on something else for supper, but we really wanted hamburgers. Half an hour later, Mr. L decided to go to another store four towns away (yes, we were in rural NY at the time). So off he went. When he came back half an hour later, he reported that store No. 2 didn't have hamburger patties either. So guess what? He bought some hamburger and made the patties himself. We were so entrenched in our thinking that we just didn't think outside the box. BTW, it turned out to be the best burger I've had in a long, long time. Of course, I like lettuce, (my own grown) tomato, dill pickle chips, onion, catsup and mayo on it. Yum-Yum. Have you forgotten that you could make something simple because it's usually available premade for you? Not really as I tend to cook from scratch. And I always make the patties, so I can put what we like in them. As for only needing a pound of meat- why didn't you ask behind the meat counter? Wegman's decided not to build here in the Albany area, which means I hit one when I go home or if there is one nearby when we go camping (last year I think I hit every one of them in the Gettysburgh PA area!). I have to deal with Price Chopper and Hannaford, neither of which come up to their standards. It didn't occur to Mr. L to make his own until the second store. And we were in the sticks at the time. There was nobody on duty in the butcher shop. I love Wegmans, but they've just had a HUGE upheaval and moved everything in the store around. It will take me months before I know where everything is. At least they have store maps available--it's a BIG store (Mt. Read). I'm big on making things myself. It just seems easier, more economical and lets me make the proportions I want instead of my conforming to what's already packaged. I'm glad your burgers were great! I usually work from scratch, too, and one of my fave kitchen must-haves is a hamburger press. Stick in the meat, push down the plunger-thingy and instant perfect 1/4 pound patty. I still buy cake mixes in boxes, though. Always taste better than my own. I usually just buy the ground beef because I live on my own. I will split the packages into smaller portions if they are bigger than 1 lb. and freeze them or just plan a couple meals with the meat. Then I have leftovers for lunch! I'll buy frozen things like pizza or pasta dinners to keep around for when I work late but I enjoy cooking and baking from scratch. It's relaxing to me. I tend to make my own since most stores don't have pre-package foods for one person. Yup...I'm pretty much a "from scratch" girl too. Buy my baked beans in a can tho. I buy burger in bulk then come home and make a lot of patties, freeze them, mix a meat loaf and freeze it, brown some for sauces etc and freeze it in freezer bags. The patties, I put wax paper between them and I have a big square "bowl" with an air tight lid that I put them in. Then when we want burgers, I've got them. Of course I have a good size freezer that allows me to do that kind of stuff so that helps a lot. Most of our dinners are homemade. One of the kids favorite meals is pasta with block cheese shredded on top. By the time we all sit down the cheese is all soft and yummy. Another "from scratch" person here. Actually, I've never even seen the purpose of the pre-made patties. (I truly don't mean this to sound rude or condescending.) If it's a matter of time, it doesn't take that much time to throw seasoning into ground meat and form patties. If it's a matter of volume, buy a lot and then freeze smaller packages. I'm a single person, and I often buy the bigger packages, and then freeze smaller packets in sandwich bags that I can thaw out one at a time for lunch/supper. Hmm that reminds me we have a mould to make burgers, it we can get some good quality, fresh mince we could have a go ourselves next weekend! We get the store made hamburger patties from time to time when they are on sale, but we like making our own. DH calls them 'Gourmet Burgers' (he's so humble) and they are yummy. 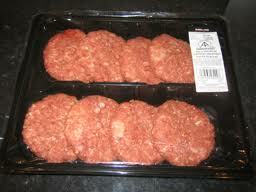 We get hamburger when it's on sale and freeze it in manageable sizes for future meatballs, meatloaf and hamburgers. DH will make as many hamburgers as he can with what he has. We eat one each that night and freeze the rest of the patties for future. I do like frozen meals like Lean Cuisine for convenience and (for whatever reason) Lady K loves Chef Boyardee spaghetti or ravioli, but we make most of our meals from scratch. Lorna- there was one Weggies in PA that I swore was so huge I was going to have to leave bread trail crumb to get out! I've been dealing with them forever- from when they were just a small dairy store in Rochester. My mom remembers going to the farm to buy milk and when the old man delivered it! Well, the hamburger looks to yummy. I even wanna taste it. That burger sure looks good! I almost never eat hamburger though. I really dislike McDonalds. The only good thing there are their french fries, and milkshakes. I buy my meat pre-packaged, and sometimes in huge packages and divide in smaller portions for the freezer. Can't live without my freezer! It can feed me for months. I tend to cook from scratch myself but rarely make hamburger patties for hubby...but found ground chicken which I had a hard time finding lately and can now make some chicken burgers stuffed with feta..yummy! 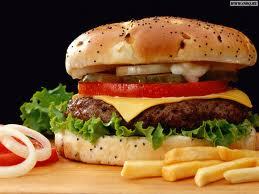 We buy hamburger and nearly everything else in bulk and package for individual meals to put in the freezer. My husband made a hamburger press the size we like and I put the patties in sandwich bags so I can take out however many we need at mealtime. They thaw out quickly.